Five of the most popular areas in New Zealand include Auckland, Wellington, Christchurch, Queenstown, and Wanaka. Below, we will walk you through each one with the top sites to see in each. Auckland is New Zealand’s largest city, known for lively culture and nightlife plus plenty of activities for nature-lovers. Here you can go hiking on the volcanic island of Rangitoto or the Waitakere Ranges rainforest. Auckland is New Zealand’s only true metropolis and also the economic heart of the country. It is the point of arrival for most visitors to New Zealand. Some of the standout sites in Auckland include One Trill Hill, which is the symbol of the city (pictured above). Take a hike through the walking trails lined with flower beds and large old trees. The slopes that make up the volcanic shape of the hill contain remnants of a pre-European era village. Waiheke Island is the most popular of Auckland’s Hauraki Gulf islands. The island is home to many picturesque art galleries and cafes, plus white sand beaches and many trails winding along the coastline. Auckland City Center is home to several striking examples of early architecture. The Ferry Building is a landmark on the harbor, as well as Auckland Town Hall and St. Patrick’s Cathedral. Puhoi is a small township that is an easy day trip from Auckland. It has kept much of its original early-settler character and has a timeless feel. It was founded in 1860 by immigrants from Bohemia (modern-day Czech Republic). New Zealand’s capital and main port city is Wellington. Home to Museum of New Zealand Te Papa Tongarewa, the national museum. Te Papa means “Our Place”. Inside you will find six floors of exhibitions, cafes and shops dedicated to New Zealand’s culture and environment. Princess Bay is located just outside the city center. The rocky and pooly beach here is great for swimming, picnicking, and of course, instagramming. Matiu Island is an ideal destination for a day trip from Wellington. Here you’ll find many short hiking trails up to the highest point with great views across to the mainland. Lastly, Wellington Waterfront (pictured above) is where you will find Queen’s Wharf and Frank Kitts Park. These two sites are are surrounded by beautiful buildings including the Civic Center and the Museum of New Zealand. Christchurch is the largest city on the South Island, and the capital of the Canterbury region. New Regent Street and Victoria Street are two picturesque streets to wander through. Hagley Park is home to the Botanic Gardens, a golf course, and greenspace. Other top sites in Christchurch include Riccarton Market, where you’ll find 300 vendors come together each Sunday, making it the biggest market in the country. Here you will find fresh veggies, plants, furniture, clothes, art, and second-hand goods. Christchurch Botanic Gardens cannot be missed. Here you can explore the unique foliage and plants of New Zealand. The Arts Center of Christchurch was once a bustling area of the city and the hub for arts and culture. However, the 2011 earthquake badly damaged a lot of the buildings. A commitment has been made to restore the Arts Center, scheduled for completion in 2019. Sumner Beach is a coastal suburb of Christchurch. It is home to Shag Rock, a famous landmark that is visible along the road to Sumner (pictured above). The resort town of Queenstown is best known as the place where much of the Lord of the Rings trilogy was filmed. Outdoor enthusiasts visit Queenstown for kayaking, bungee jumping, white-water rafting, hiking, and skiing. Milford Sound is near Queenstown for those looking for a more relaxed adventure. Milford Sound is part of the Fiordland National Park World Heritage area. This part of the South Island is known for their pinot noir and has 75 wineries. The view of Queenstown from Bob’s Peak (pictured above) on Ben Lomond Mountain is worth the 45-60 minute hike. Be aware that it is a pretty steep hike! The Queenstown Gardens jut out into Lake Wakatipu, and you will find great views of the city and mountains here. In contrast to Bob’s Peak, the hike up the mountain here is more leisurely. Another site to see in Queenstown is Skippers Canyon. The historic and scenic gorge spans almost 14 miles. Lastly, Gibbston Valley is one of the closest wineries to Queenstown. The vineyards are perched on the rugged mountains near Kawarau Gorge. It is famous for Pinot Noir. Lastly, Wanaka is an ideal place for fishing, hiking, skiing, wine-tasting or golfing. Situated on the clear waters of New Zealand, Wanaka is the fourth largest lake and is located just a short drive from Mount Aspiring National Park. Rippon Vineyard (pictured above) is Wanaka’s oldest vineyard with beautiful lakeside views. It has been in the same family for five generations. Pinot Noir is the specialty here as well (it is the specialty of New Zealand in general). 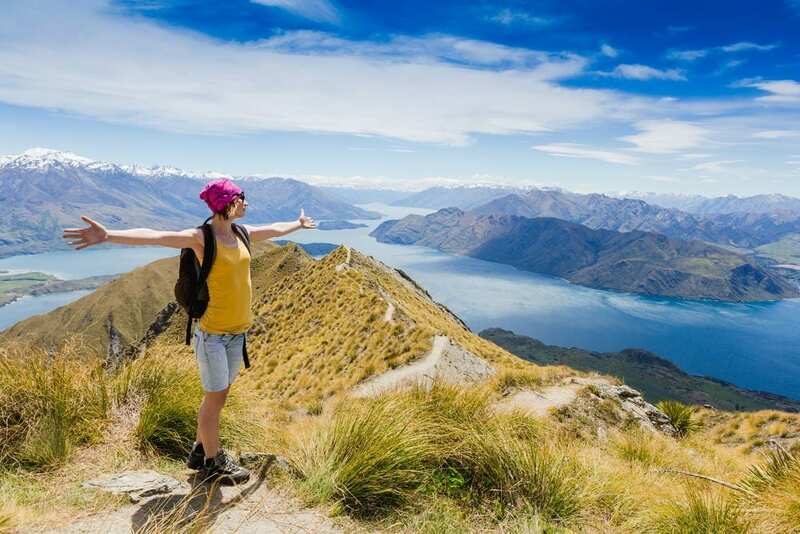 The Roys Peak Hiking Trail offers panoramic views of Lake Wanaka and Mount Aspiring. The trail is a 10-mile journey and takes about 5-6 hours through zigzagging routes to reach the 5177-foot summit. While in Wanaka you should take a horse trekking tour in Cardrona Valley. The horse or bike tours will take you through the gold mining valleys and plateaus of New Zealand countryside. Lastly, Mou Waho Island is a must-visit for nature and wildlife enthusiasts. Take a scenic cruise across Lake Wanaka to reach the island, where you will find a secluded lake at the highest point. To book your own adventure in New Zealand, call us at 402-281-3022!